See here for important purchasing information! You must have your supplier install/load the datacap forms and the debit encryption keys before they ship it to you. Extract the driver to the computer. Wait for Device Setup to complete. Navigate to Control Panel > Device Manager. Under Other Devices, right-click Gadget Serial and choose Update Driver Software. Click Browse my computer for device software. Click Close when the wizard completes. The PIN Pad should now appear as Hypercom L3xxx in the Device Manager. You must have your supplier install the datacap forms before they ship it to you. This device will not support datacap EMV so not recommended. RS232 Serial does not require a driver. DO NOT ORDER the IO block 132-601-00-R which as 3 serial ports, the third serial port which has the 9 PIN connector will not work. Full testing of this device is not complete. It is not known if it will work over WAN Terminal Services, though does appear to work over LAN Terminal Services using RS232 Serial port redirection. You must have your supplier install the datacap forms before they ship it to you. If you turn it on and it says “Lane Closed” instead of “Welcome” then the datacap forms were not loaded. The mx915 is slower than the Equinox L5300 and the contactless reader is not as good. Under setup wizard→credit/debit card verification→payment processor then click credit card under Process as Credit or Debit make sure that Do not prompt option is enabled. The Test Initialization button will test your installation. 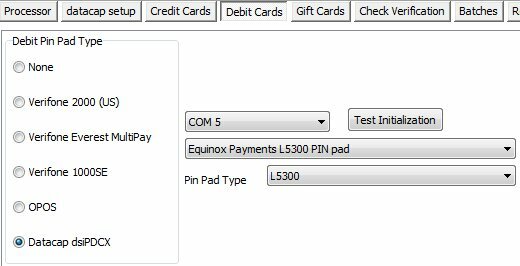 Check Use Sig Capture for Credit Cards.